Alright. I really have to start doing some work now. 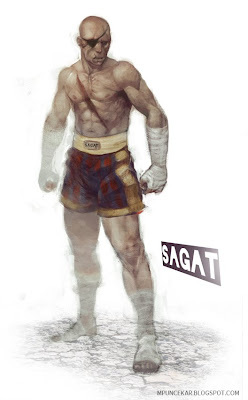 Not a whole lot changed on Sagat from his original design. Mostly just gave him some new shorts and roughed up his appearance more. I consider him an aggressive fighter more than a defensive one, so I smashed up his face pretty bad. 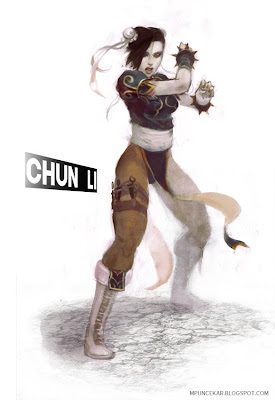 Here we have my Chun Li redesign, again from Street Fighter. 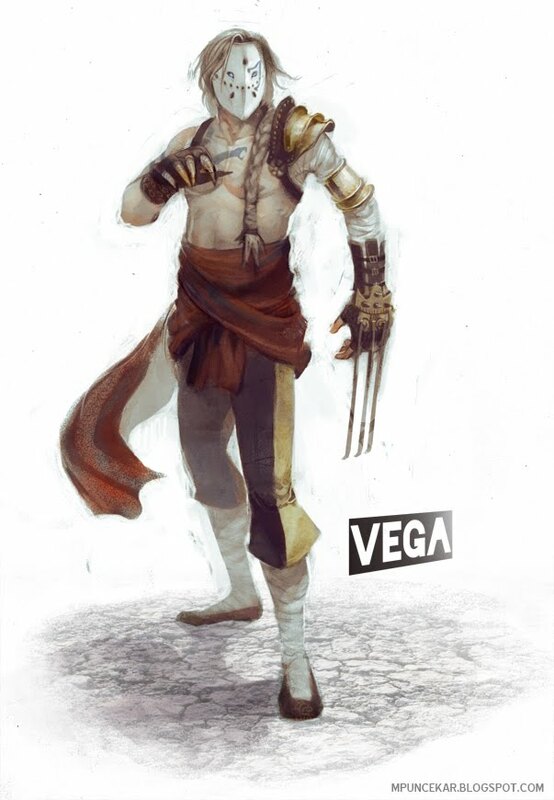 So when Vega couldn't represent, she was my go to character. She had a gift, and that gift was button mashing kickery. No other character could tear through the bonus stages like her. She's also a girl. And I really need to paint more of these strange creatures. I'm always doing soldiers and knights, and I never remember to get some girls going. Depending on how far I get on my actual school project I should have been working on, I want to squeeze in at least one more Street Fighter. leaning towards two fellows named E. Honda and Sagat. Guile could be fun, but I can't stand that signature hair. It just looks so freaking terrible. While working on this I was listening to the new MGMT album. Not thinking I like it very much. On the plus side I discovered the internets virtual keyboard, and I got sucked into attempting video game themes. I at least couldn't stop until the Morrowind theme was perfect. Over in the Sketch-2-Death camp, a fellow CCADer started this activity, where we are all being a bunch of fanboys, and pretending we work at Capcom, sketching out some Street Fighters. I took early dibs on Vega. Why? Because he is clearly the most super fantastic, and I mean that in the most arrogant way. While he may be a pretty boy under that mask, he was just so incredibly awesome in street fighter 2, that he just had to be done. He climbed on the cage wall, and slashed his foes to pieces with the only real weapon in the game, and it's an AWESOME weapon to have in a fighting game. No one beats him in sheer amazingness. Which is why they never bothered to change his character in future incarnations, because he is just that perfect. I did try to make him a bit more matadorish, tone down the muscles, and spruce up that silly arm band though (he's still perfect though!). I also punched some holes in his mask, because that thing has to be hot. So that leaves the only real addition being the claw hand. I was just going to put another claw on him, but he isn't wolverine, and I think it fit's the whole snake tattoo thing resembling the fangs. Plus, just think of the cool in-game moves those could bring in tandem with the claw. Lastly, I'm on spring break! But I don't have my scanner cord (although I have the scanner) so while I had planned to post a metric crap-ton of art on you to make up for my absence here the last month, I can't unless I get to a scanner. It'll be a busy month or so working up to graduation, so updates will be very sporadic as I get my portfolio together and finish branding, but I'll try to keep updating. Lastly, lastly... everyone needs to tune in or somehow get their eyes on HBO's The Pacific. It's two episodes in, and it is glorious. 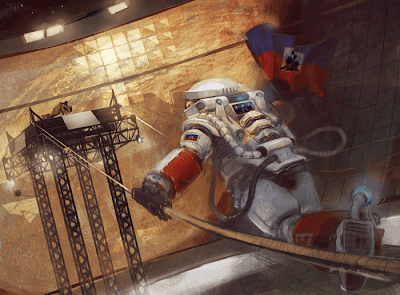 So this is what I had to paint up last night for the CCAD Illustration Workshop Class. It was completed on a very tight timeframe, and at this point I swear it's the only way I can get my brain in gear. I've come to the conclusion, that I enjoy tight deadlines. Bit masochistic I guess, but I just like the silence of the night and the 4:00 am Mcdonald's breakfast trips. Working on something during the regular daylight hours just feels... wrong. And I have an excuse to drink an unhealthy amount of coffee. Story on this one was that we had to take our character concept we had done previously, and relate it to the Haiti Disaster. It was an odd one, very odd. I kept it simple though, since my character is placed in time quite a bit after the disaster. Not to mention I didn't feel quite right putting my character there in a mocking way. I tend to live in a box, and check the news every long once in awhile with no tv, and any reading time going to books or fun stuff like cracked and science/tech, not counting the infinite loop of wikipedia. So when I finally did see photos, it was the day before he gave the "twist" of the assignment, since when we designed the characters we didn't know the second part of it, and they weren't the easiest photos to look at to say the least. This was my solution. I wouldn't mind getting some more arena equipment in there and solve some outstanding issues, but for now it's off of the queue and on to something else.